I have used Android for three years and I really like it. I won’t say that Android is the best operating system for smart phones, but I can say that phones with Android are very adaptive. And I like that. Besides that, we can pick a cheap or expensive phone from a set of Android phones. My old Samsung Galaxy S has worked very well and has survived many hits. 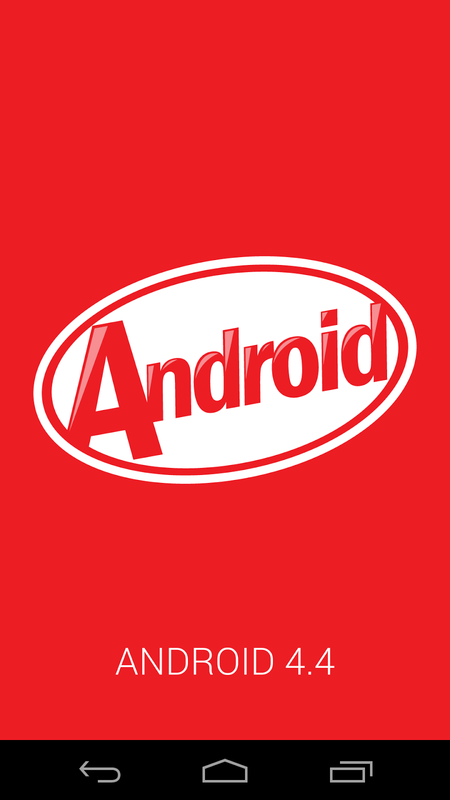 After many ROM installations, it worked well but becomes slow with latest Android versions. It simply doesn’t have enough memory. The main reason for retirement was battery. I charge it two or three times over day – with airplane mode over night. Immediately after Google Nexus 5 presentation I start for searching where can I bought it. After some days, I went to store and bought it. Now I have it some days and here are first impressions. On my way home, I went to Mobitel store and take a new SIM card. Nexus 5 uses micro SIM card, so you can’t use it with old SIM. Unboxing is always full of excitement if you didn’t try a product before. But everything was fine and nothing was missing. Box isn’t full of accessories – you will find just a (one) USB cable for computer and electricity, small booklet without any good text and a utensil for opening a SIM card door. First feelings are that phone is light and solid build - but nothing more. This is not surprise and I didn’t expect that phone will be like a tank. We should know that Nexus 5 is a best buy at the moment (in this price/hardware range). You can’t find better phone for this money. - speaker (not speakers – it is just one in phone) isn’t the best quality. Otherwise, the phone is handy, with good design and everybody (who tries the feeling) likes it. There is no removable battery – I don’t know what will I do, when system crashes … usually battery removing is the simplest solution. There is no expandable memory; I will have to live with 16 GB of memory. Good thing is, that you can buy a wireless charging, but you have to pay for that pleasure. The screen is bright (even on sunlight) and the automatic brightness control works very good. Even the looking on phone from angle won’t be a problem. Colors looks good, but we can expect many kernels with changing colors support. I won’t write much about battery life. 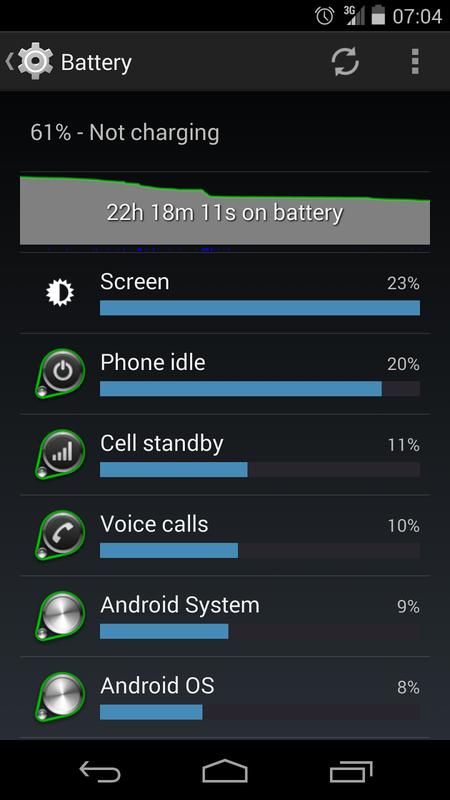 2300 mAh battery is what we expected from LG. 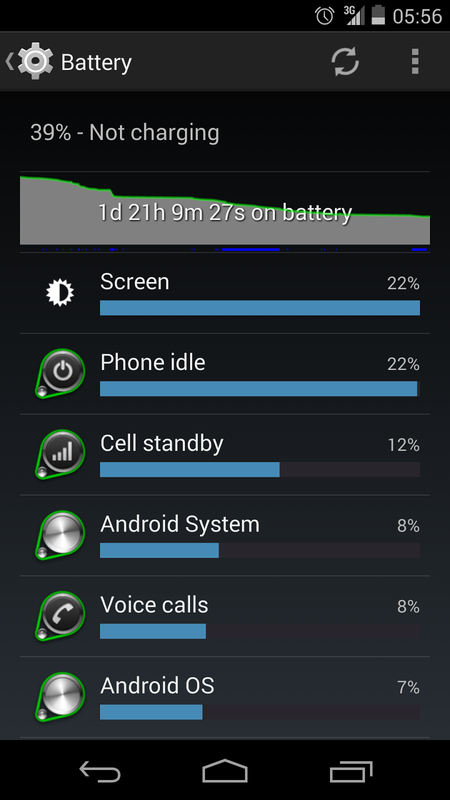 But talking about battery life is very ungratefully. I simply can’t understand when people are comparing their battery life. There are hundreds of possible influences (way of using, running applications and services, networking conditions, battery condition…). Only technicians in labs can compares batteries, all others are just subjective reflections. Nexus 5 has 8 MP back camera and front 1.3 MP camera. At the moment, I simply don’t have enough photos to say something. First impressions are that camera isn’t the best, but don’t understand this wrong. Especially colors are vivid and things in focus are sharp. At least I have a flash now on my phone – my old Samsung didn’t have it. If you didn’t hear until now, I can tell you, that phone is fast. Really fast. Someone can read this as joke, but it is the first Android phone without lag. With Android 4.4 Google introduces ART as alternative to Dalvik. While Dalvik uses a Just-In-Time compiler and a lot of the compiling is actually done on the user’s device each time the app is run, ART is different. ART precompiles bytecode into machine language when the apps are first installed turning them into native applications. Installation will be slowly and more storage will be used, but hey, we will have faster phone! 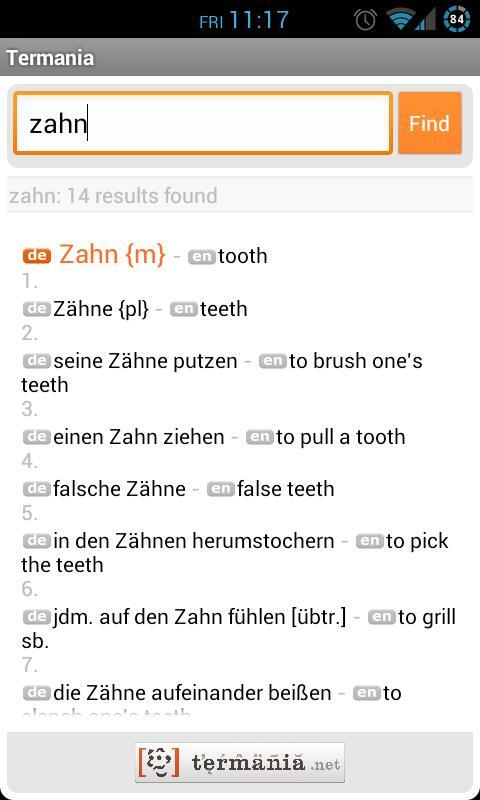 At this moment, Google recommends using old Dalvik. ART is here for developers, but everybody can change runtime and run phone with it. Maybe some applications will have problems and I found one of them – IGO navigation. Because I use IGO a lot, I decided not to use (faster) ART for now. You can just try it. Booting is fast. You won’t wait long when you start a phone at the morning. I promise. One of the first thing to do was unlock bootloader, install recovery and prepare root access. 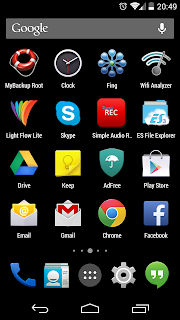 I have used TWRP recovery (CWM didn’t work for me). I recommend this guide. Now I’m waiting for good custom kernel and ROM. Phone is new and developers have many works those days. But nothing so big can’t be done perfectly. And without listening remarks from people. 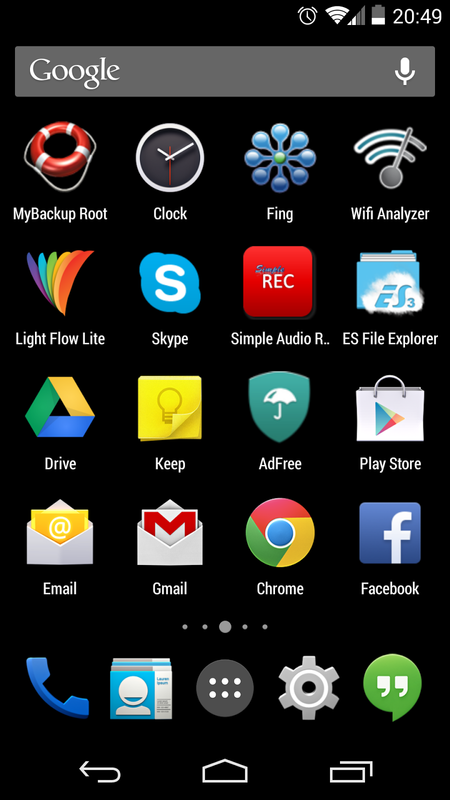 Nexus 5 has only 4x5 grid for icons. Icons are really big and I’m sure that many users waits for custom ROMs to change that. Android don’t allow users to change quick toggles behavior. Some toggles are missing and the other have clumsy behavior. I’m waiting for custom ROM. I would like to see when network traffic is on my phone. You know, that small arrows near the signal bars. Notification for battery status looks very old. There are better solutions - circle battery mod. For years, Android has the same ringtones and voices. Some of them are heard as they were chosen accidentally. After you take a photo in Camera, you can review it. Nonsense. You have to use Gallery or some other application. Extended Power Button Menu - all custom ROMs have it, just Google don't add this feature. One of the biggest problem I have with contact in my corporate Exchange account on new Android. The People/Contact shows me ALL email address I have communication with them in last years. So I have over 22 thousands contacts (mostly email addresses) in my Contacts. On my Exchange, I have just 140 contacts. I checked all setting on Android (what contacts to display ...), restarts, make a voodoo ... but nothing helps. I tried changing settings on Outlook, delete suggested contacts on Exchange... nothing helps. Because I have used this feature in the past, I'm sure that this is a bug. I report it to Google and it looks, that they will check it (I’m not alone with this problem). So, in previous lines you can read my first impressions with Nexus 5. Questions and comments are welcome. I will add some photos and more camera impressions latter. For resolving issues observed under 8), I've removed all my "suggested contacts" in the outlook and then forced sync on both Outlook and the Nexus 5. Voila, all the (useless) contact emails are gone from the phone. I also tried this before, but didn't work. I use two different version of Outlook (at homa and at work) and I do this on both computers. Didn't work.